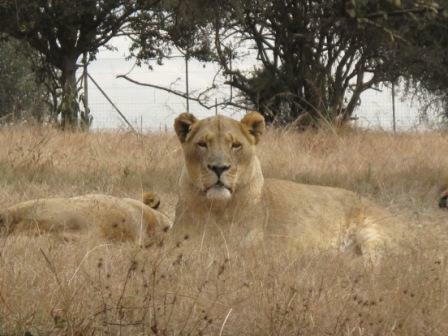 South Africa Trip – Day 15 – Lions! World Cup Quarter Final! 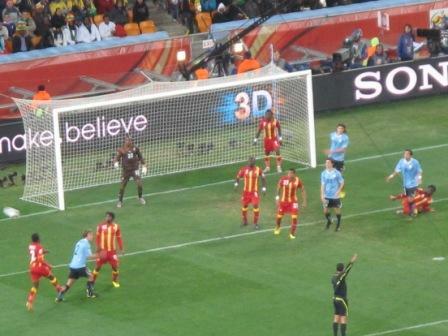 Today our primary target for the day was to attend the Quarter Final match between Uruguay and Ghana. As a result our morning and early afternoon were pretty much set aside as free time to do whatever we felt like leading up to the game. We decided to visit the Lion Park near Bryanston. There is another Lion Park closer to the Elephant Sanctuary we visited the day before but we couldn’t find it since we left the instructions for the GPS back in our room. So we just decided to abort yesterday and try again today. 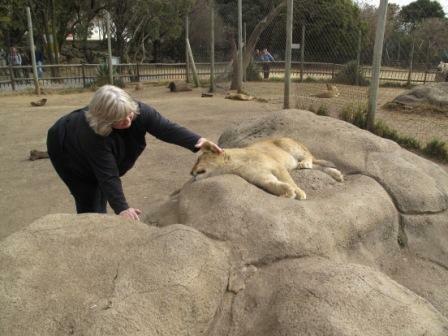 The Lion Park is located in Lanseria which is a short drive outside of Johannesburg. 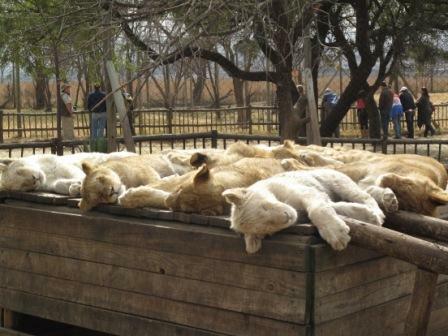 The Lion Park which was established in 1966 by the Chipperfields Circus is home to more than 85 lions, including rare white lions, as well as many other animals from cheetahs to hyenas to zebras. Other than the standard facilities such as the curio shop and the kiosk where you can buy snacks and such the animal center is broken up into three primary areas: the petting area, the drive through area and the lion camps. 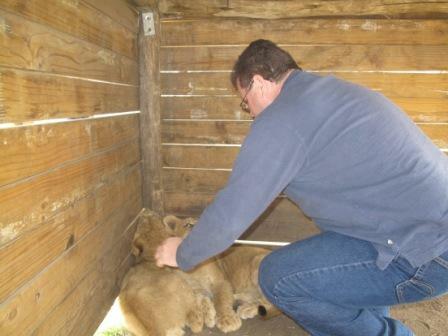 The first area is the petting section where you’re allowed to pet baby lion cubs. This is the primary attraction in this section in addition to being able to view several of the other animals on display in their individual pens. Obviously the pen where you’re allowed to pet lion cubs is the highlight of the facility and as a result is where the line forms. Here’s where we started our visit. Fortunately we got there early enough that the wait time was minimal. Groups of eight people or less are allowed into the pen at one time. After three for four rotations we finally got our turn with the cubs. Cynthia was quite thrilled to have the opportunity to pet the little “kitties”. However, the “kitties” were a little less thrilled to have me pet them. There was one cub in particular that flat out didn’t like me messing with him. Every single time I tried to touch the cub it took a snap at my hand. Thankfully I have fairly quick reflexes and managed to keep all of my digits. What’s that old saying about touching a hot coffee pot? You only have to do it once to learn your lesson. Apparently I’m dense because I took a stab at this feisty little critter three times before I finally pushed onto some more amenable cubs. So we pet lion cubs to our hearts content and then took brief tour of all of the other animals on display before we pressed onto the next section of the park. The second section of the park is a drive through section. You’re confined to your car with the windows rolled up the entire time. You’re in search of the various other animals they have free roaming through this section of the facility. At most we saw one or two Kudo and two Zebras that walked right in front of our car, briefly halting our pass through this section. The short of it is there’s not much to see here, especially if you’ve been to any other park or safari while in South Africa. Just press straight on to the final section of the park. The final section of the park is the Lion Camps. As best as I recall there are four to five separate camps in this section of the park each capable of being isolated from one another. 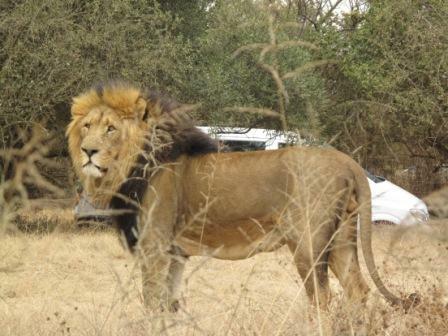 This is because there are three or four distinct prides of lions on the property and each pride is sequestered in its’ own section of the park. Otherwise each of the prides would potentially hunt and kill each other. So once you enter the main gate that leads into the individual camps you pick and choose moving from camp to camp. The natural flow is left to right so this is what we did. This process is basically a stop and go affair. The second that the driver in front of you spots any kind of lion on comes the brake lights and everybody behind sits until each driver decides they’ve spent the desired amount of time. Naturally you can find yourself sitting for quite a while if you happen upon a rather large and entertaining pride. There was one particular pride in camp three that pretty much caused a grid lock on both sides of the looping single lane road. We managed to get several good shots with the slightly rolled down window including a few of the handsome male of the pride. That is until I caught one of his many wives coming up alongside my side of the car starting straight at me. Having been sized up for dinner I quickly closed the window and we started the stop and go process of heading towards the park exit. It was jolly good fun. 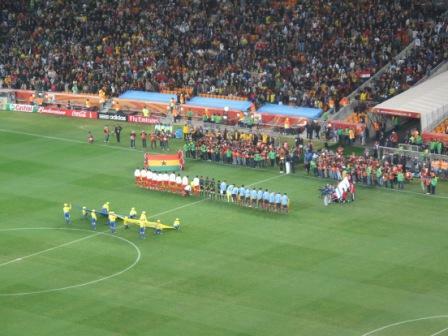 Our final futbol match for the World Cup was the Quarter Final between Uruguay and Ghana. 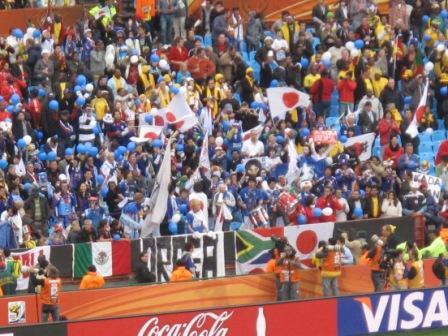 There was no parking available on site at Soccer City during World Cup matches with the exception of the spaces set aside as V.I.P. access only. Attendees had to use either Park & Ride facilities or the train. If using the Park & Ride facilities you had to pre-purchase online a parking pass. Fortunately the bull dog known as yours truly searched and searched well beforehand and found this out long before arriving in South Africa. We used the Witwatersrand University parking lot. A kind of funny side story here. We pulled up to the security gate where the guard checks for your online parking pass. When I rolled down the window there were two Algerian college students standing there and one asked me if I could take them into the parking lot. Apparently not only do you need a pre-paid parking pass to enter the parking lot you can ONLY enter the lot in a car! They needed somebody to literally drive them through the gate so that they could use the free buses provided by the city on the other side of the gate. Yes, we gave the young lads the shortest hitchhike in recorded history. Remember me saying that there is no parking access at Soccer City except V.I.P access? Well, apparently that is more of a security measure than anything else. The Park and Ride buses quite literally drop you off one full mile from the stadium entrance. I know it was a mile because I know how long it takes me to walk a mile. You literally walk with a mass of humanity along a mile long narrow path that’s cut through acres of empty parking spots. Needless to say once again I don’t care for FIFA’s heavy handed to light handed to heavy handed security measures. 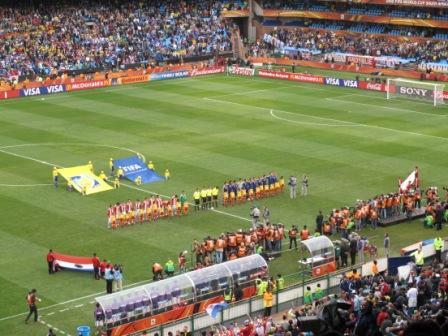 Soccer City was originally built in 1989 to host the Olympics. 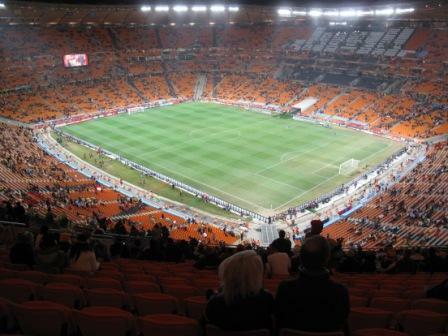 It was completely remodeled in 2009 to host the World Cup. Locally it is known as “The Calabash” due to its resemblance to the African pot or gourd. 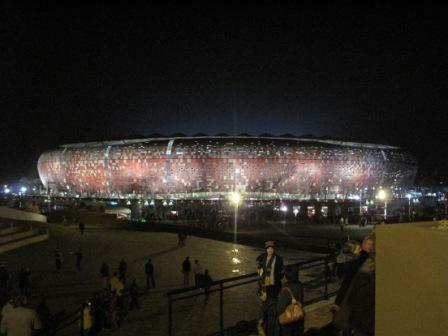 I must say when approaching the Calabash at night when it is fully lit it is a stunning looking stadium. I give kudos to the South Africans for a job well done. We navigate to our seats which are once again just about at the top of the stadium, approximately three or four rows from the last one, situated on the corner of the goal line. Although we are fairly far up I’m surprised at how well I can still see the playing field. Over the past few days since the South African team was exited the tournament the South Africans have come to rally behind the Ghanaian. There have been billboards lining roadways urging support for the one remaining African team, street vendors pushing Ghanaian team wear at every street corner and so on. There is no doubt after a glance around the stadium that it is extremely pro Ghanaian in support. Virtually everybody within sight is decked out in the Ghanaian colors or red, yellow and green. The noise was deafening throughout the match each and every time the Ghanaian squad simply touched the ball. Like taking two aspirin to cure your migraine headache our earplugs quite literally could only take the edge off the thunderous roar from the crowd. It was an almost surreal experience. Both teams fought admirably well and fairly evenly throughout. Otherwise, it was a really good match. The match was forced into overtime. You could cut the bitter disappointment with a knife when at the very end of overtime the Ghanaians missed what should’ve been a sure goal on a penalty kick. Once gone to shoot out the Uruguayans managed to secure a 4-2 win, ejecting the Black Stars from the tournament. The silence was deafening in it’s own way. When we exited the stadium I became the victim of a crime. 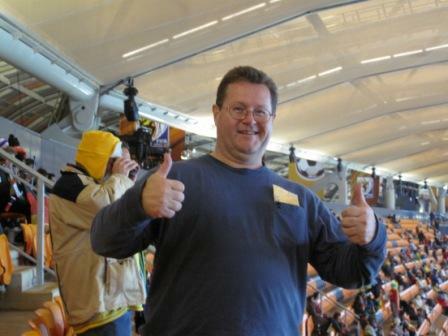 I was carrying a satchel to all matches which contained my cell phone, camera, tickets, rain ponchos, a small amount of cash along with one credit card for purchases. Just steps beyond the stadium gates I felt something slightly cold and wet hit my right ear. That happened three times in total before I finally realized that it was bird poop. So I reached up with the sleeve of my jacket to wipe my ear. That’s when it happened. At least two foreign looking men, perhaps three, wearing large and loose fitting ponchos pickpocketed me. They used that moment when I took my hand off of the satchel to unzip the pocket and steal the contents. Apparently they threw the bird poop on my as a very clever distraction. They got my cell phone which obviously made me mad but that wasn’t the end of the world. What scared me the most is I had forgotten to take photocopies of my credit cards out of my satchel and place them in our safe when we arrived in JoBerg. They now had copies of my credit cards. What a sickening feeling as we made the slow mile walk back to the buses. 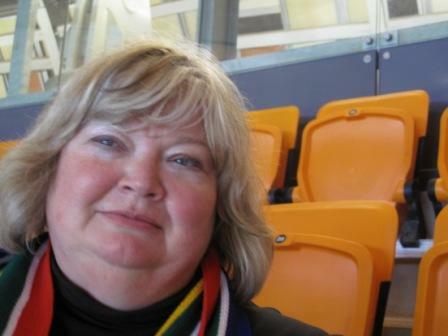 This was the one dark cloud cast over an otherwise wonderful trip of a lifetime to South Africa. I guess you could say we were fortunate in that it did happen on our last day in the country. It had a minimal impact on our trip because we didn’t need to secure replacement credit cards while abroad. That could be all done upon our return home. More to come in a couple of hours, literally. 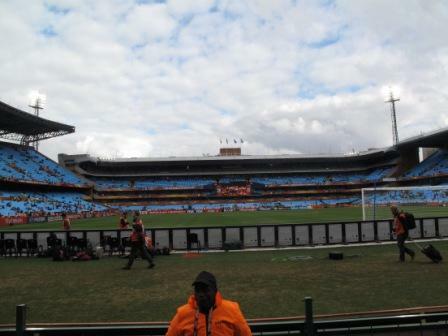 South Africa Trip – Day 12 – Johannesburg and some more futbol! Today’s travels took us from Port Elizabeth to Johannesburg. Fortunately we didn’t have to quite get up at the crack of dawn as we did when we flew from Cape Town to Port Elizabeth. This time we were able to secure an 8:45AM departure on British Airways. Between the later departure time, the very quick 15 minute drive to the airport through Port Elizabeth and the smaller regional airport located in Port Elizabeth we were pretty much able to get up at our normal 6AM wake up time as though we were still stateside and heading to work. That was much more manageable. Our hosts at the Bluewater Beachfront Guest House were kind enough to provide us a quick and slightly early breakfast before our departure for the airport. I’d like to extend my many thanks to them and their hospitality during our stay. The travels from Port Elizabeth to Johannesburg were fairly uneventful. Managing the Port Elizabeth airport is quite easy since it’s so small although they do have a serious lack of seating beyond the security gates. As I posted in an earlier posting we had a British Airways flight aboard a 737 so that was quite nice. Upon arrival in Johannesburg we were able to secure our luggage fairly quickly and a nice gentleman showed us the easiest way from the carousels to our rental car agency across the street for which I tipped him a few RAND. Shortly thereafter we had our rental car secured and on our way. Welcome to Johannesburg! What’s that in front of you? Brake lights. Yep, we’re finally in the big city. Incredibly enough this is the first time during our entire trip I recall any form of traffic. We left the airport on our way to our bed and breakfast and upon the first major interchange we were stopped dead cold. Fortunately we were able to navigate our way through it in a reasonable amount of time before we were off again to our B&B. Just bear in mind once you hit “JoBerg” (as everybody calls it) no matter the direction you’re definitely in a big city and can come to a halt at any time or place. Plan accordingly. Our home while in JoBerg was the Cape Elegance Bed & Breakfast in Bryanston. Bryanston is a gated “suburb” of Sandton which is an extremely popular suburb of Johannesburg for both residents and tourists. When we first started our search for lodging in the JoBerg region Sandton kept coming up over and over as the recommended place to stay. Unfortunately even with several months of advanced booking I could find absolutely nothing available in Sandton proper; apparently the entire free world had already figured it out before us. After some due diligence I finally stumbled across Cape Elegance Bed & Breakfast. I must say I’m very happy that we found this little gem in Bryanston. Cape Elegance is literally minutes away from favored shopping and dining as well as a short drive to any number of attractions in the JoBerg area. Your hosts that live on the property are Denyse and Gene Killassy. They did an excellent job of welcoming us into their home and seeing to our every need during our stay. Their property is lovely with beautiful gardens throughout and a plethora of birds calling it home. The accommodations were spacious and clean including a self catering kitchen. A full English breakfast is included as well as free wireless internet, satellite TV, etc… In short, Cape Elegance is recommended and I wouldn’t hesitate to stay there again while in the JoBerg area. After check in we had a quick lunch of pizza and beer at the local pizza joint near the B&B before we were off towards our primary target of the day: the Round of 16 match between Paraguay and Japan. The drive between JoBerg and Pretoria where the match for the day was being played was actually not that bad until we got to Pretoria. 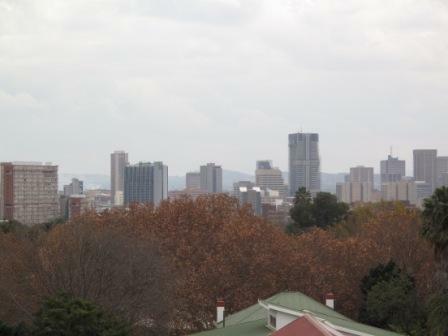 The capital city is roughly 45-50 minutes from the commercial city of JoBerg without any appreciable traffic. It’s once you arrive to Pretoria in search of a futbol match that you hit a little snag. 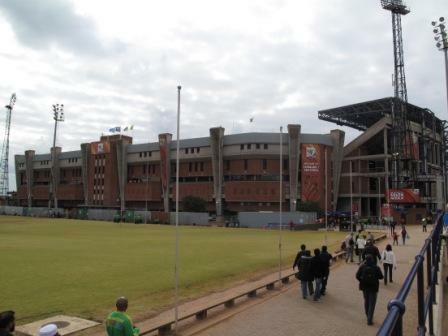 The stadium in Pretoria is an ancient rugby pitch in the inner city portion of Pretoria. As a result the infrastructure to get there leaves quite a bit to be desired. It is totally comprised of surface streets chocked full of street lights. After a bit of time and effort we were finally able to follow the well marked signs to a park and ride lot for the stadium. After dumping the rental car in the park and ride lot we easily boarded the bus for the short ride to the stadium. We’re fortunate in that the bus dropped us off quite close to the stadium. We were not so fortunate afterwards. As briefly mentioned the futbol pitch in Pretoria is an old rugby pitch. This ancient hunk of junk was built in 1906 and the first concrete stands that could seat only 2,000 people were built in 1923. The stadium has been constantly expanded and now the updated hunk of junk can sit just under 43,000 people. It looks like the pitch has been updated recently. How do I know? After entering the gates we actually got to our seats on the opposite side of the stadium by walking ON the end of the pitch. When’s the last time you actually got to walk on the pitch at a sporting event? High school? This is a World Cup match for goodness sake! They have security out the wazoo and we’re freely roaming the pitch were the players are located? Way cool but way dumb at the same time. FIFA astonishes me at times. 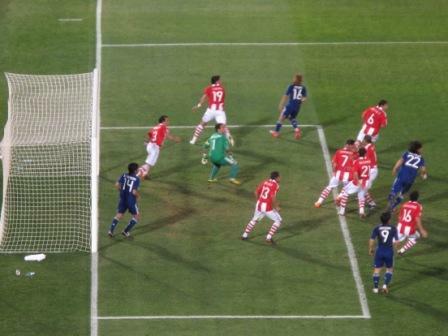 The match between Japan and Paraguay was a little on the lackluster side. That might’ve been affected partly by my lesser interest in these too particular teams. The highlight of the entertainment for me was the lively South African sitting next to me with the turbocharged vuvuzela. 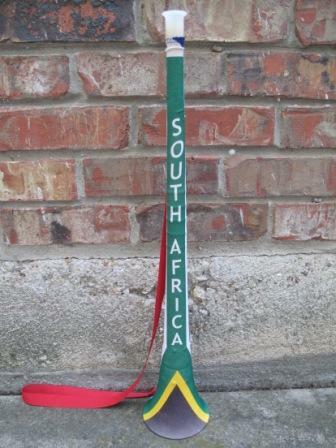 I didn’t realize it but apparently you can modify your vuvuzela to make it especially annoying. To give you an idea of what this thing sounded like close your eyes. Now imagine a horn that is a cross between a kazoo and a trumpet that’s capable of reaching decibels generated by a fog horn. You get the picture. My incessant seat mate had the lung power of a deep bell diver. It sure made for a lively event in the end! Oh, by the way, Paraguay won 5-3 on penalty kicks. Now for the two mile walk back to the buses since security forced us out a different door than the one we came in. Grrrr….